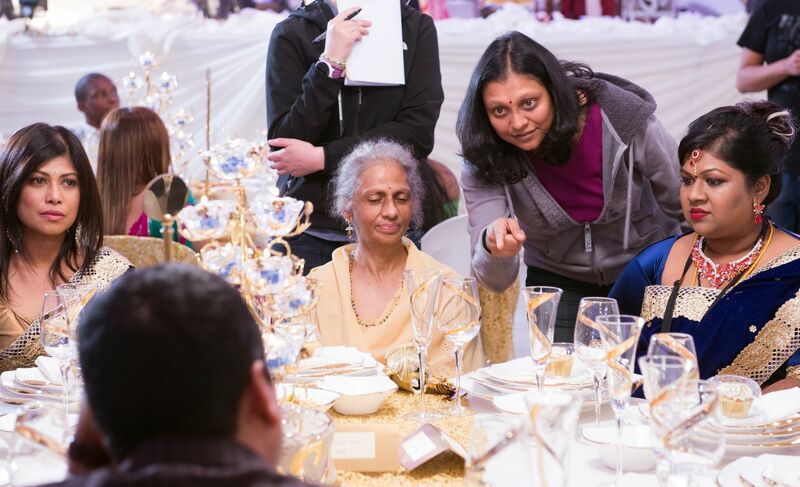 It’s been a few years since the Kandasamys and the Naidoos rekindled their once tainted friendship in Keeping up with the Kandasamys, and makes a welcome return for the eagerly awaited sequel Kandasamys: The Wedding, produced and directed by Jayan Moodley, from a screenplay crafted by Moodley and Rory Booth. Kandasamys: The Wedding is an attempt to provide international audiences with a glimpse into the lifestyle and subculture of modern-day Indian South Africans; their aspirations, dreams, and challenges. Like viewers get drawn into the inimitable characteristics of a Harlem or Bronx in New York, so too will Kandasamys transport them into the vibrant and colourful suburb, allowing them a first-hand authentic experience of the local nuances of Indian South African culture, especially since at the heart of the story is a big, fat Indian South African wedding! Whilst the setting for the film is indeed unique, its theme most certainly has universal appeal. Essentially it explores how the son is emotionally torn between his love for his mother and his wifeto-be and how mothers, no matter how old their kids, want to have a very real impact and say in their children’s lives. The story comes alive as the two mother’s scheme and plot, and push their agendas, ever so subtly, until an explosion becomes inevitable. Light-hearted, and entertaining, the story is supported by an array of colourful characters that celebrate the rich way of life in Chatsworth, and serves as a reminder of the important value of the mother, aiming to bring characters to life and to take movie-making in KZN to yet another level. It comes at a time, when the film industry in this Province has finally turned the corner, and will be a catalyst for economic development, whilst ensuring that local KZN talent remains in this beautiful Kingdom of the Zulu. However, she soon realized that her passion lay in the creative arts and embarked on this new journey in 2005 when she and her business partner Sideshwar Sing started African Lotus Productions. She has been involved in various projects for the SABC. Her particular interest lies within spirituality and the multi-faith concept. Some of the documentaries she has produced include The Shembes Walk to God, Buddhism – Finding the Peace Within and Ela Gandhi – the Hands that Serve. Her dream came true when she produced, co- directed and wrote the screenplay for the movie White Gold. Jayan takes a keen interest in youth development programmes. She is currently the producer of the Hindu magazine programme on SABC 3 Sadhana which is into its 8th season. Jayan made her directorial debut with the highly successful Keeping Up With The Kandasamys. She also co-directed The Dance, a short film produced by Quizzical Pictures. What inspired this eagerly awaited sequel? The sequel was inspired totally by the overwhelming outpouring of love and support for the first film. It was just the most special feeling having viewers feeling so attached to the film, so invested in the world of the story, so fond of the characters and filled with so much of enthusiasm and eagerness for another one. We did not decide there had to be a sequel. The fans did ! Keeping Up With The Kandasamys drew thousands of patrons to cinemas nationally, and while it was a story out of Chatsworth, it’s universal appeal was enjoyed by the greater South African audience which was wonderful to see. Your views on this? I think at it’s heart, it’s human story with universal themes and a multigenerational appeal. The characters are relatable and identifiable. Whilst it is set in Chatsworth, interfering mothers have been around since time immemorial !! I also strongly believe that the greater South African audience saw it as fresh and vibrant, new content. More importantly, it told it’s own story and that was that people want to laugh. They want to watch local films! We all love to have a peep into someone’s community, someone’s lives, someone’s living room! The first film gave South African viewers this opportunity and they lapped it up! Whilst laughing, we learn. By learning, we can understand more about each other. With understanding, respect follows. Can we expect the same from the sequel? Absolutely! We have created a proudly South African film and are extremely excited that the film has attracted an audience that goes beyond race. Kandasamy’s Wedding is described as South Africa’s very own big fat Indian Wedding and Everyone’s Invited! Tell me more about this? If we were going to portray and Indian wedding, it could not be small. It had to be colourful, spirited, energectic and dazzling. The thinking was that people had to leave the cinema remarking ‘Did you see the location of the wedding? Did you see the outfits? How beautiful was the ceremony?’. The ‘Everyone’s Invited’ tagline is a play on the Indian community that previously never heard of the ‘Admit 2’ phrase. It was always a huge pot of breyani and everyone was welcome! What do you think makes Indian weddings unique and different from other weddings? Firstly, it’s a few days affair. Secondly, everyone gets involved. Thirdly, it at some point feels like a giant party! And lastly, a wedding or any event tells a story about the people and the Indian wedding in itself tells us so much about the community. Were you inspired by other Wedding Films? My favourite wedding film is undoubedtly ‘Monsoon Wedding’ by Mira Nair. I do believe it’s a masterpiece in it’s own right and it definitely served as an inspiration for this film. It’s also about romance, friendship and family values…. Your views on this? Only love is real. Everything else follows and finds it’s own place in our lives. Friendship follows from loving our friends. Family values follow from loving ourselves and being at peace with our family values. So love is the foundation for this film. I truly want people to leave the cinema feeling some sense of love, remembering someone they have lost contact with, falling in love all over again with their partners, rekindling friendship and most importantly loving themselves. Tell me about your collaboration with screenwriter Rory Booth? Was it a collaboration made in Heaven? How did it start? Were there any obstacles? Rory Booth makes writing the best job ever. It certainly was a coloration made in heaven. It never feels like we are writing. It just feels like two souls connecting on some level and having the best time ever. His writing skills, his creativity and his sense of humour is something to be marveled at! I adore working with him and if I write again, my wish is to do so with him. The film is described as not only an Indian South African story that celebrates a colorful and rich sub-culture, but also a KZN and SA story. Your views on this? Our province claims this film and it should. We feel so proudly KZN. Durban is often seen as the poor cousin to other provinces and this film makes us all just feel somewhat satisfied. Our city looks beautiful and we get to showcase so many different locations that people now want to visit. I often say that everyone knows of a place called ‘New York’. We simply see it in so many films. We want everyone to know of a place called ‘Durban’. How much as the local industry changed since you started working in the Industry? There has been a major shift. It seems like we have finally turned the corner with regards to filmmaking. Just a few years ago, it was almost impossible for any person from a disadvantaged background to even dream of making a film or telling their own story. There have been many strides made, but we still have a long way to go. One step at a time, one film at a time! Know your story. Know it so completely that you are able to answer any question about it. Love your story. You must completely fall in love with it. This shows in the writing. Immerse yourself in the story. At some point while writing, it’s just you and your story. Let your opening catch the attention. The first few minutes are critical. Every scene must be meaningful. Every line must have an impact. My sincere hope is for them to appreciate each other more. Not just our family members, but just each other in general. I would love for the film to give people an opportunity to reflect. Am I a Jennifer? Am I a Shanti? It’s only upon reflection that we answer some difficult questions about ourselves and then hopefully make some changes. After all, we are all on this journey where we simply want to better people. I honestly don’t know. I’m looking forward to rest and quality time with my family.